I was surprised at how quickly the piece shipped, even from all the way across the pond. Two thumbs up for quickness! I was a little disappointed, though, that the piece arrived in a fairly plain paper mailing envelope. The brand's pieces aren't break-the-bank expensive, but when I order a piece of jewelry, it makes it feel extra special when it's presented in a luxurious way. The piece did come in a really lovely gray velvet pouch -- although it was creased from the shipping envelope, sadly. But even though the packaging fell a little short of my expectations, the bracelet inside was definitely up to snuff. 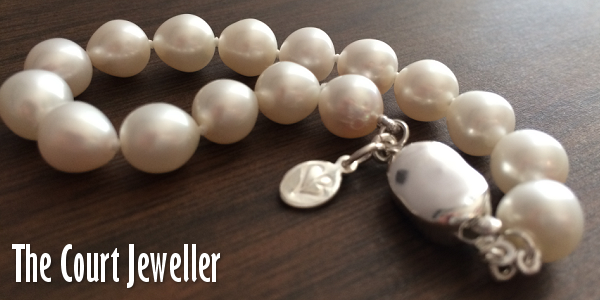 Sixteen lovely cultured white pearls are strung together and fastened with a sterling silver clasp. 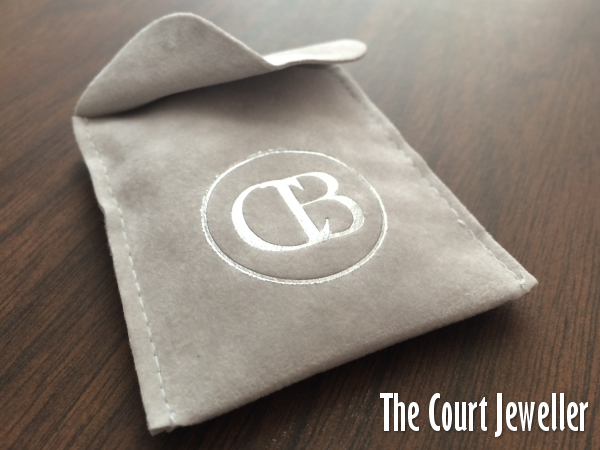 The clasp also features a tiny silver charm with the heart-shaped Claudia Bradby logo on one side, but it's not obtrusive branding. I love pearls, but I often feel like classic single-strand pearl necklaces are a little too mature or too sorority for me. 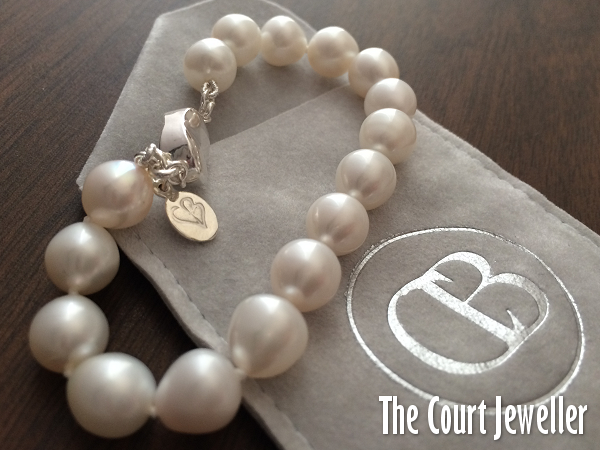 The pearl bracelet is an excellent alternative -- it feels classic and traditional, but also still a bit unexpected. 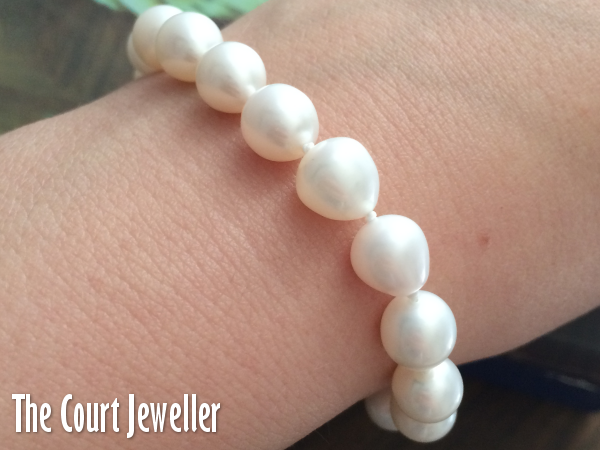 I really like that the cultured pearls used in the bracelet aren't round, because I think that adds to the "unexpected" aspect of the piece. 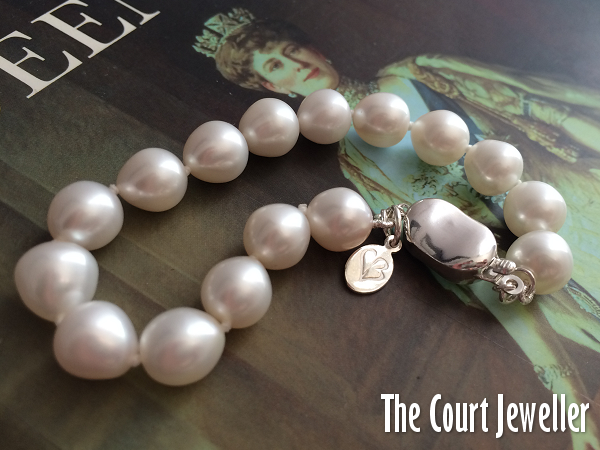 And I also love that the pearls are hand knotted -- it makes the bracelet feel more expensive than it really is. The bracelet feels substantial but not overly heavy, and it's extremely comfortable to wear. It slides nicely up and down the wrist, but it's not distracting, and it doesn't feel like it's going to fall off. I've been test driving it for a few weeks, and it's been great to pair with both casual looks, like a blouse and a pair of shorts, and with dresses. My favorite pieces of jewelry are the ones that feel like nothing on the body, but that make me smile when I catch sight of them and remember that I'm wearing them. This bracelet definitely falls into that category. The Rebirth Bracelet appears to be sold out; it's not currently on the website. 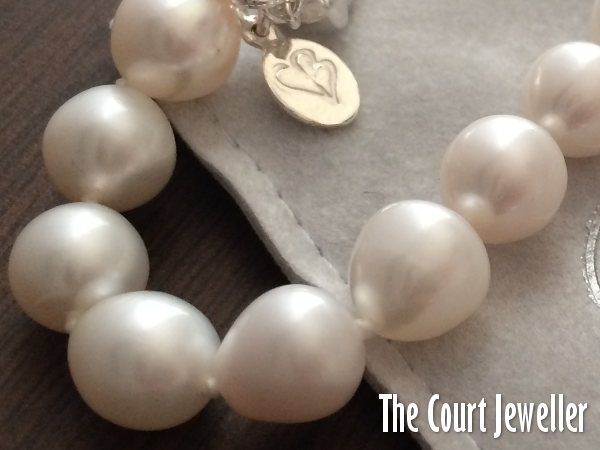 But if you're interested in something similar, the Biography Pearl Bracelet, the Sophia Pearl Bracelet, and the Everyday Pearl Bracelet are fairly close. All in all, my experiencing purchasing jewelry from Claudia Bradby has been a good one. I'd definitely be interested in buying additional pieces (especially with a slightly upgraded presentation quality), although the exchange rate does make the pearls a bit pricier for American customers like me. I like that the brand does occasionally offer markdowns on some of its classic pieces, and they also frequently provide promotional codes on social media for an extra percentage off. Overall -- thumbs up from me! Disclosure: This post is not sponsored by or affiliated with Claudia Bradby Jewellery. The item described was purchased by me with my own money. All opinions expressed are my own.